Have you ever wanted to own your own miniatures company? But didn’t want to go through the hassle of finding sculptors and mold makers or had the time for them to create and produce over a 1000 greens and masters as well as the molds involved for your dream to come true. 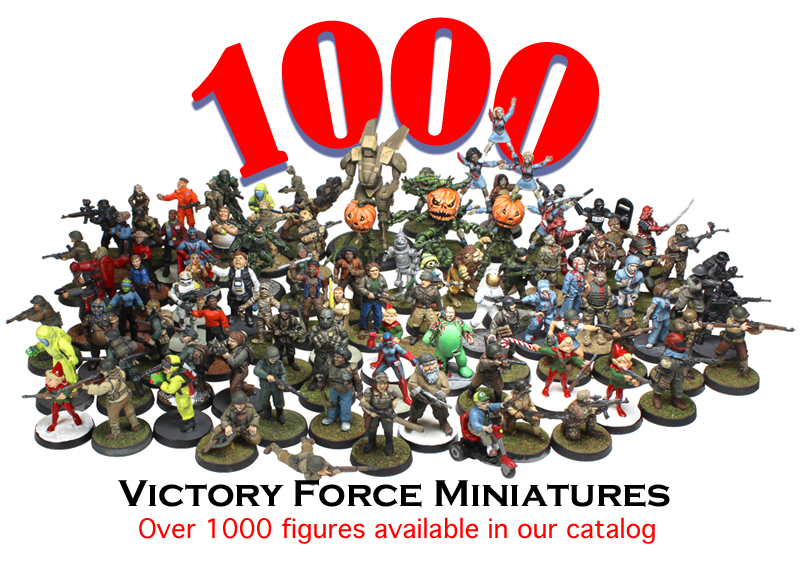 Rights to the VFM miniatures types in the sale. Will have the option to take over the Internet site and the domain name. Do with it what you will, hoard it and cast the figures for your own personal stash or sell the figures. It’s your choice, you are the Miniatures Mogul. If you are interested please submit and offer to purchase. Any offers must be submitted in writing along with a check for $5000.00 as an earnest deposit made out to JLB Studios LLC in order to even be considered. I will not answer any questions by email or phone without the first contact by mail and earnest money. I will not answer questions concerning past sales profits and expenses. This sale is not about Victory Force as a business, but sale of it as a product. Anyone wanting to purchase VFM will need to decide their own approach to sales of the figures, if you decide to sell them. You have to decide what you would have spent to pay an artist to produce the numerous greens, as well as a mold maker to produce the molds required etc. Buyer is responsible for pick up and delivery of everything purchased. A submitted offer does not guarantee purchase. VFM has the right to refuse or accept any offer. Offers must be submitted by Dec 31st 2014. VFM has the right to cancel this sale at anytime. VFM has the right to accept an offer before the deadline. Sale is not final until contract is signed. This web posting or offer does not create a contract.